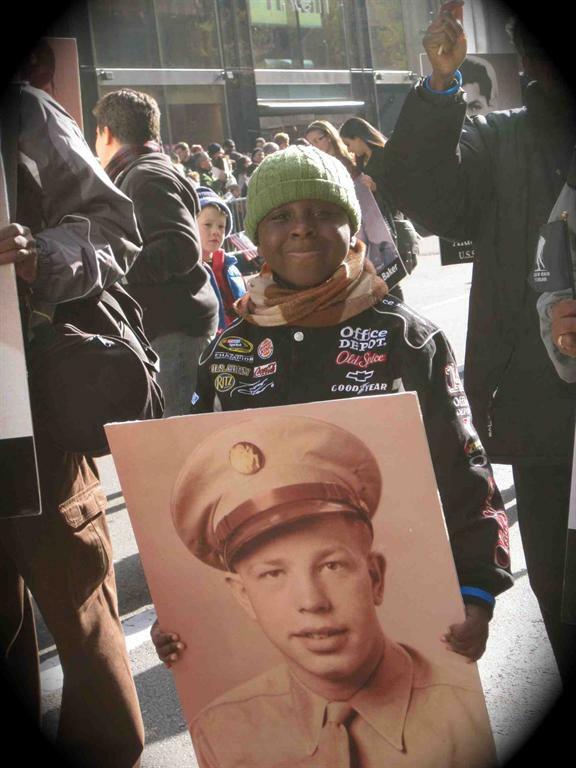 To help ensure that they will forever be honored on Veterans Day, the Keep the Spirit of '45 Alive coalition organizes groups of youth volunteers who march with poster sized photos of WWII veterans from their family and community in their local Veterans Day parade. 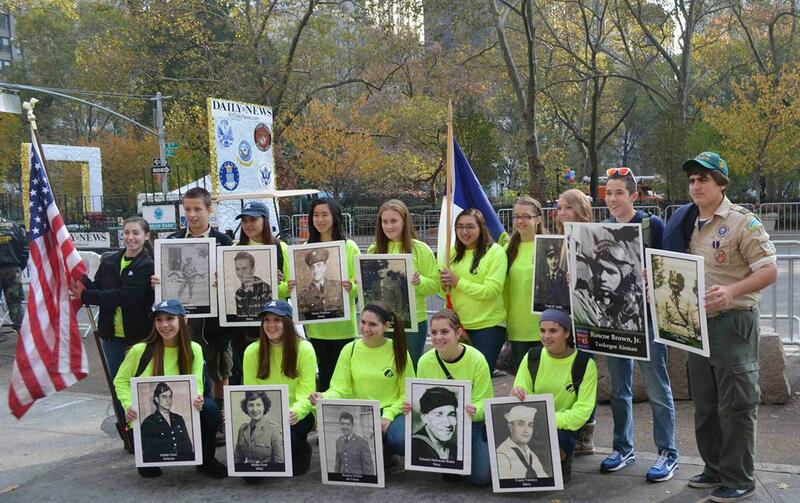 Boy and Girl Scout troops have been especially active in establishing this new annual Veterans Day tradition, and other youth leadership groups such as Jr. ROTC, Young Marines, and Sea Cadets. 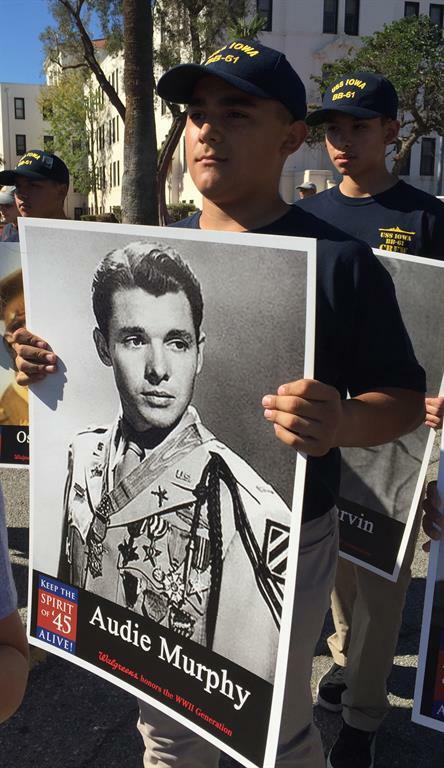 Digital copies of all photos are being collected so they can be included in the Spirit of '45 WWII Wall of Honor that will be displayed on the National Mall as part of the 75th Anniversary Commemoration in August 2020. 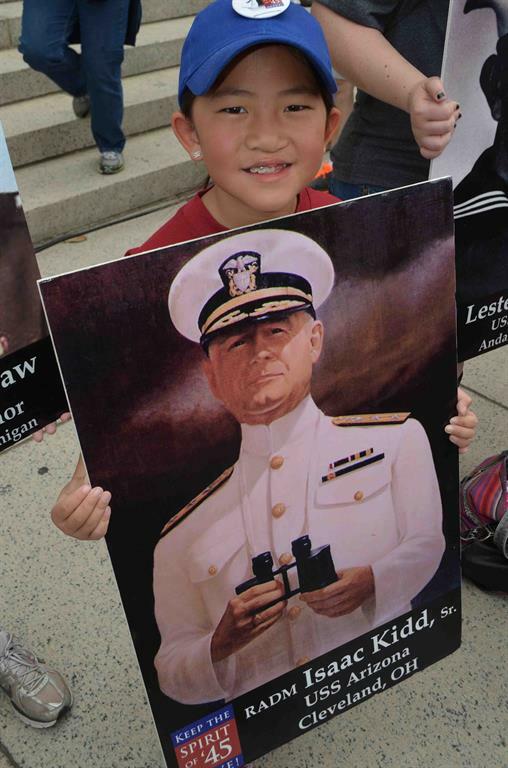 Our goal is to inspire "March of WWII Heroes" entries in Veterans Day parades across America in time for the 75th anniversary of the end of World War II in 2020, as the legacy of our Greatest Generation is carried forward by a new generation of youth. 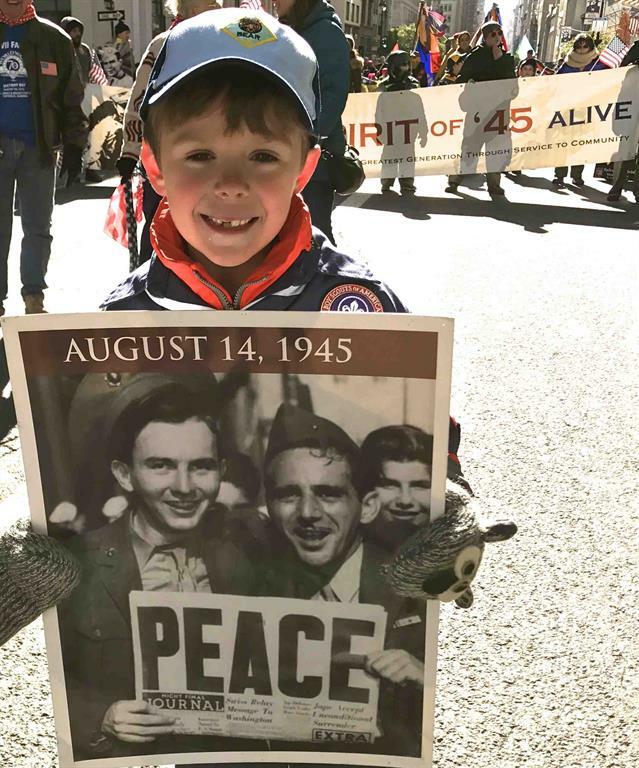 If you would like to form a Spirit of '45 "March of WWII Heroes" in your community, please contact us at Info@Spiritof45.org. 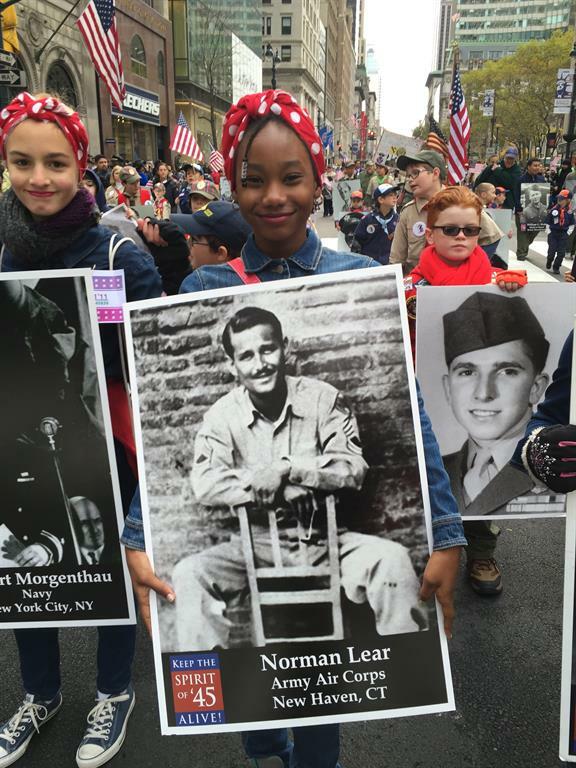 Thanks to U-Haul International and Walgreens for supporting the Spirit of '45 "March of WWII Heroes" entry in the New York City Veterans Day Parade each year! 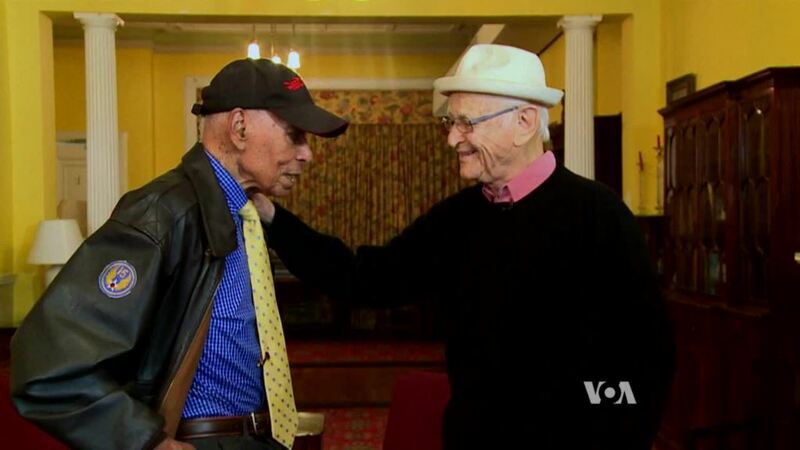 Legendary TV and film producer Norman Lear and Tuskegee Airman Dr. Roscoe C. Brown, Jr. represent Spirit of '45 appeared together in the 2015 New York City Veterans Day parade. 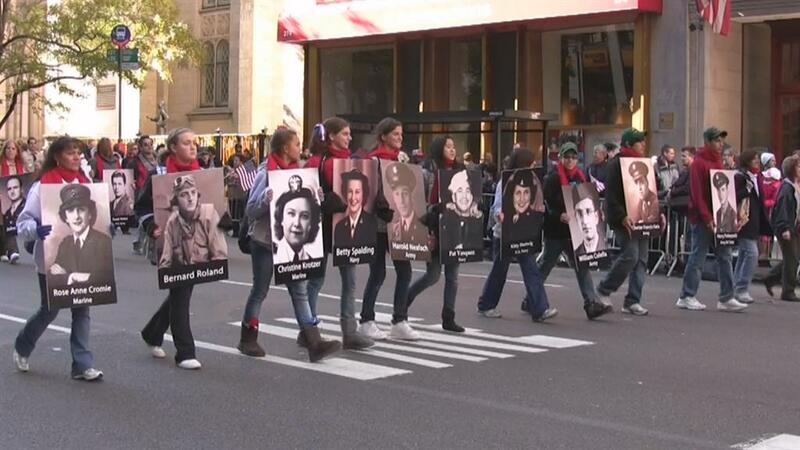 Hundreds of youth volunteers, including Boy and Girl Scouts and their family members, march 40 blocks up New York's 5th Avenue to the cheers of the crowds who line the street to see America's largest Veterans Day Parade. 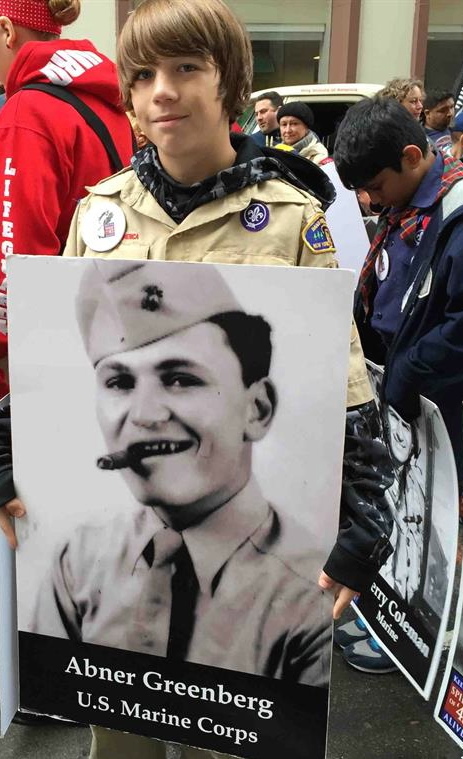 A majority of the Scouts in recent years have come from Long Island which sustained heavy damage from Superstorm Sandy in the week prior to the 2012 Parade, including several who were virtually homeless at the time they volunteered to "keep the Spirit of '45 alive." 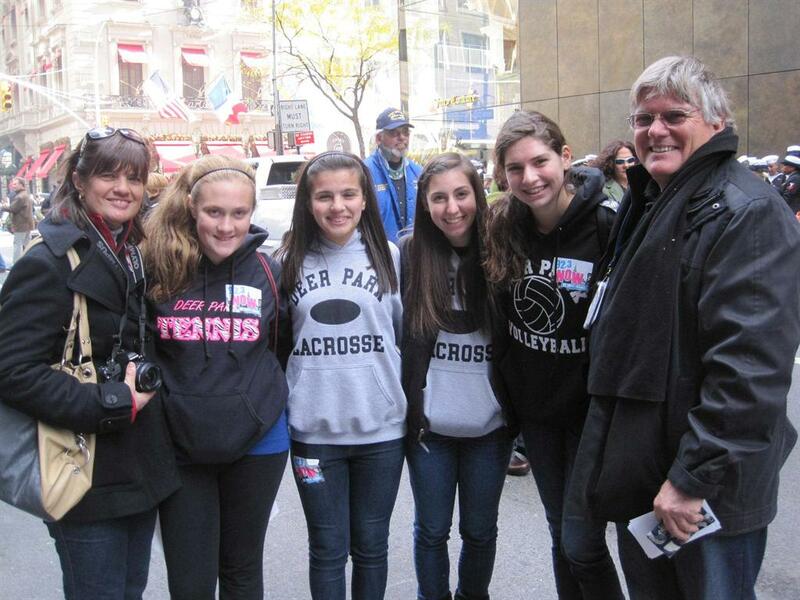 Click here for Huff Post coverage. More on our Facebook pages. 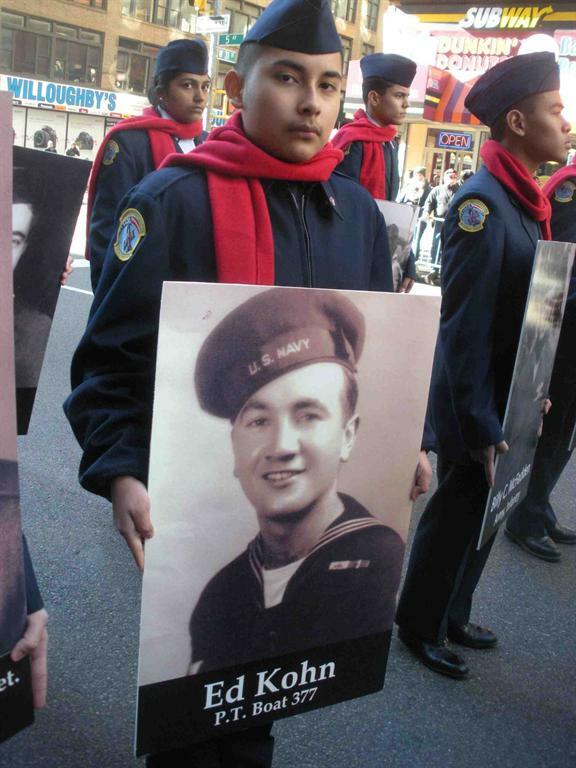 San Diego's Veterans Day Parade included a "Keep the Spirit of '45 Alive!" 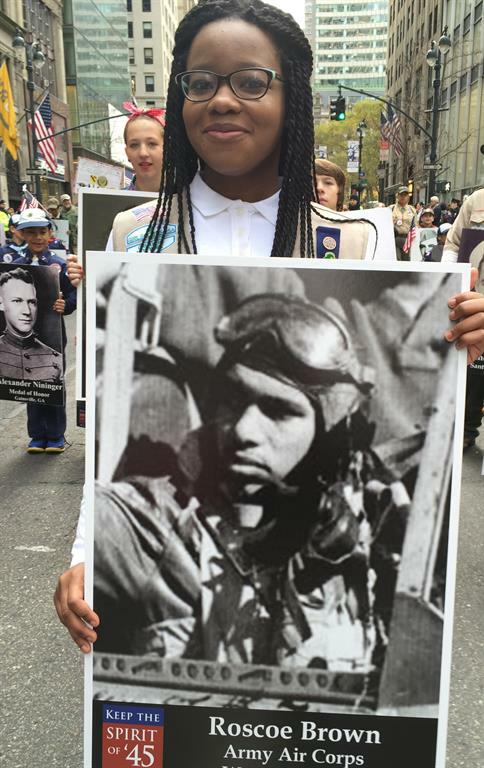 entry with 150 Girl Scouts carrying poster sized photos of veterans who had been taken to Washington, DC by San Diego Honor Flight. 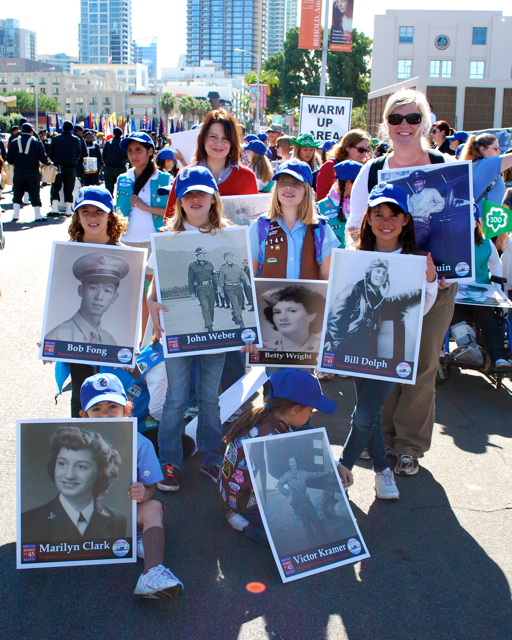 The group was organized by Teri Simas, who worked closely with national events coordinator Linda Laurie who reached out to Walgreen's to invite them to produce more than 100 poster photos for the Girls to carry in the Parade. 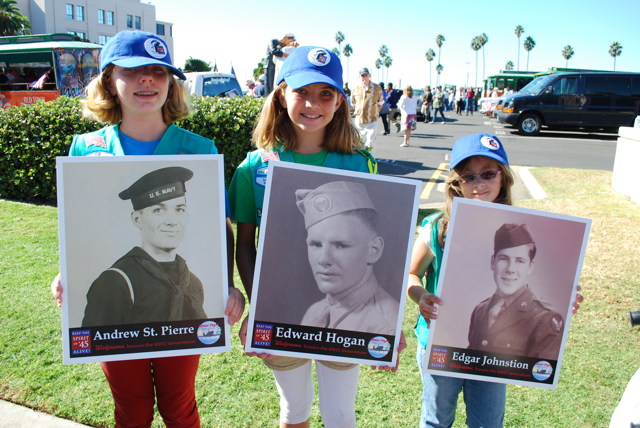 More than 150 San Diego Girl Scouts took to the streets with photos of their local WWII heroes, including recent participants in the San Diego Honor Flight. 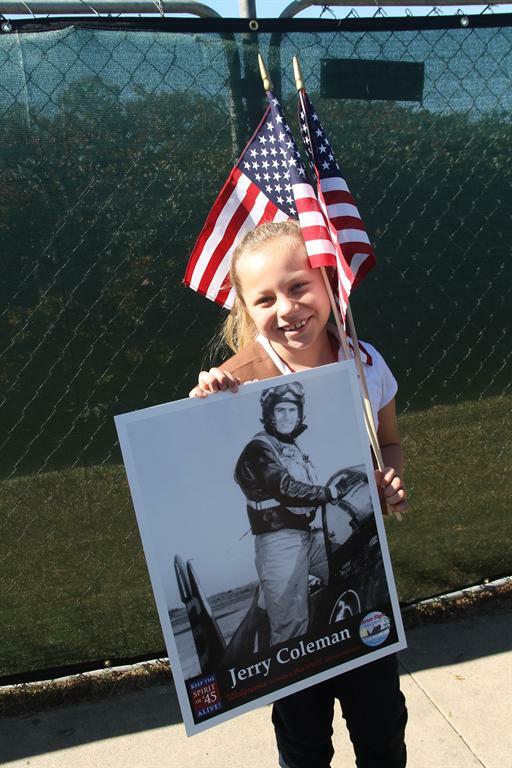 Walgreen's donated the poster photos to help keep the Spirit of '45 alive in "America's Finest City." 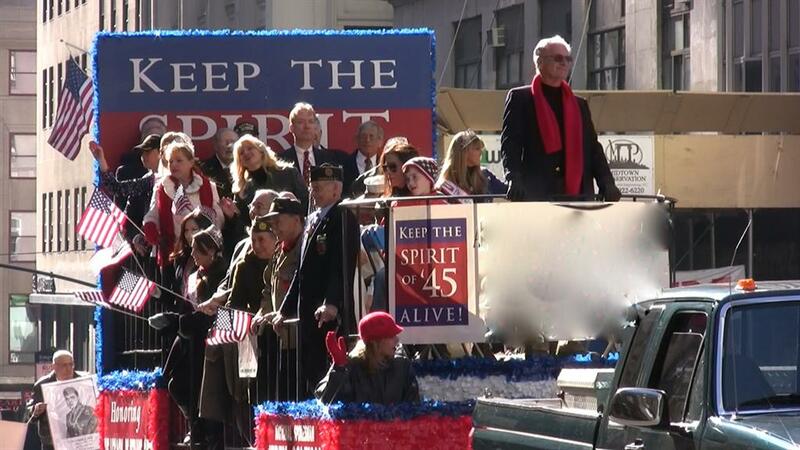 "Keep the Spirit of '45 Alive!" 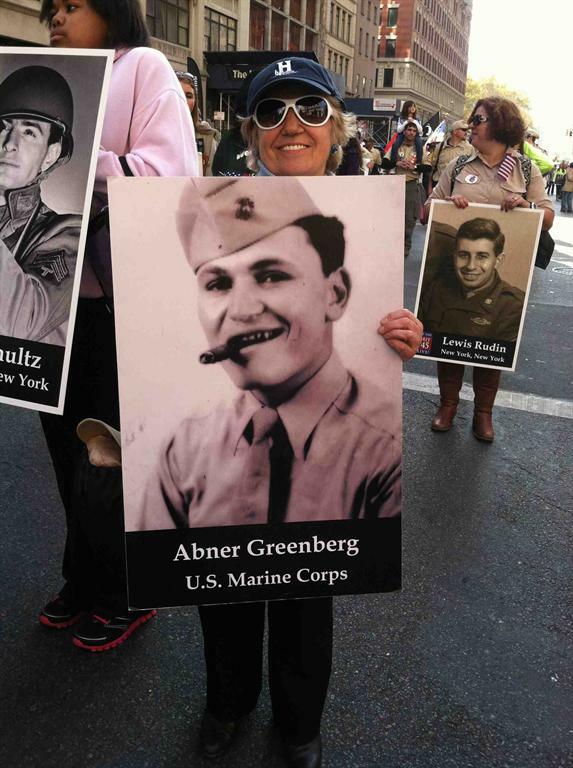 is becoming a regular feature of Veterans Day Parades throughout the country as more and more communities mobilize to honor the members of their 'greatest generation" by marching with their photos. 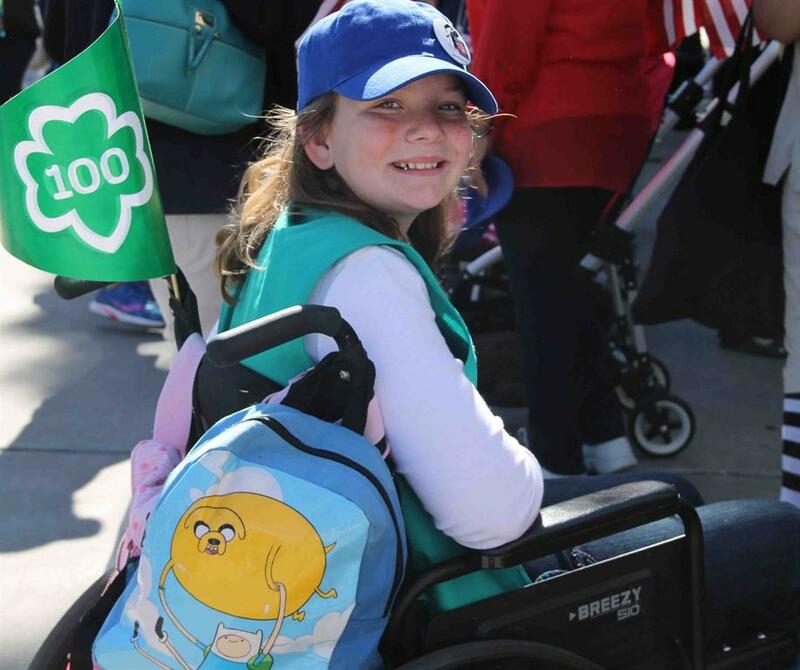 (Above) Girl Scouts march up 5th Avenue in New York City's 2010 Veterans Day Parade. 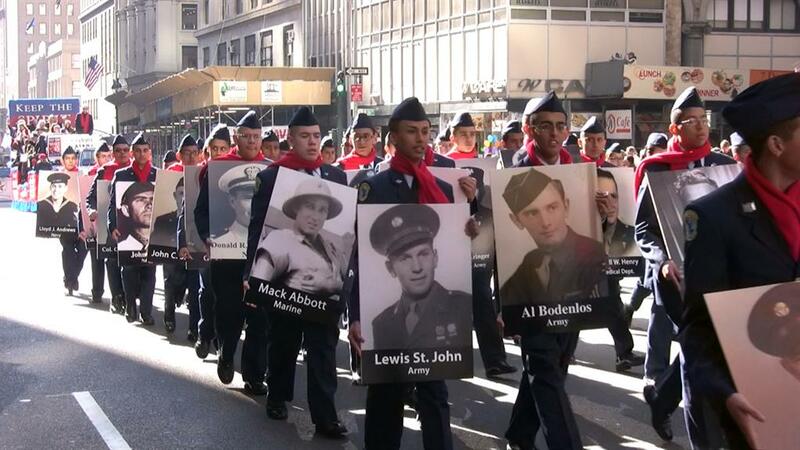 Air Force Jr. ROTC march with WWII veterans photos in Nation's Veterans Day Parade. 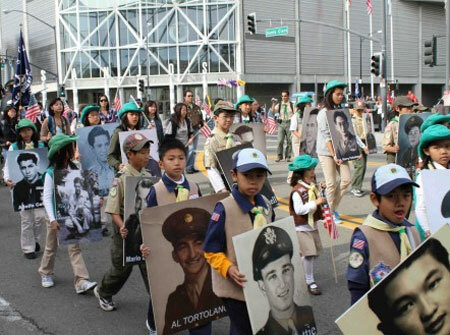 (Center) Boy Scout wearing his grandfather's WWII service medals. 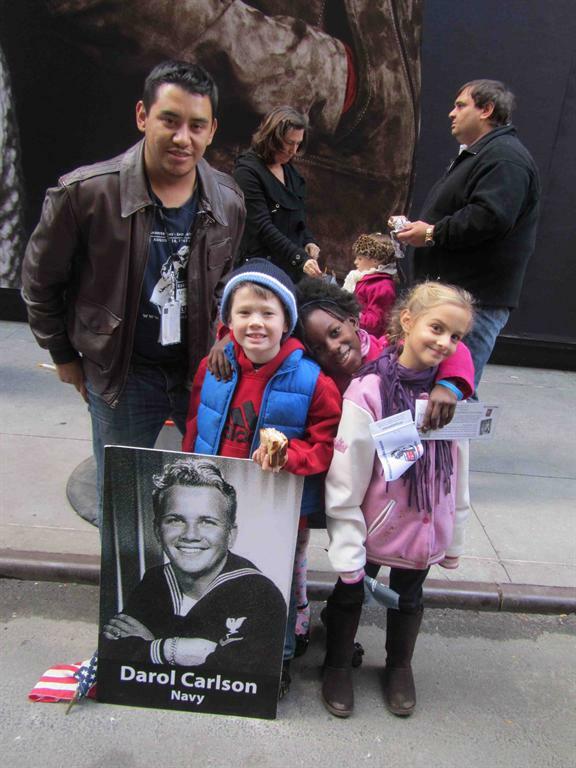 (Left, New York Spirit Kids with National Youth Coordinator Robert Corpus and photo of Actress Rhonda Fleming's husband WWII Navy veteran Darol Carlson. 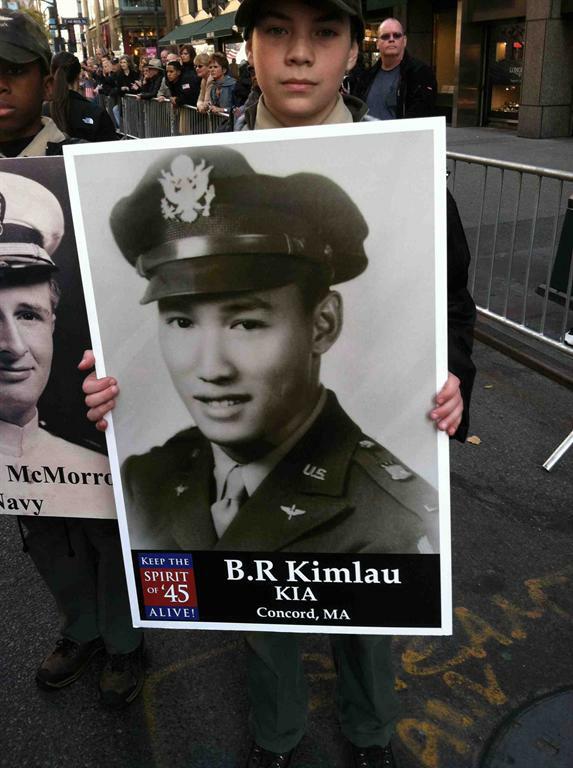 Jerry was invited to be the Grand Marshal in the 2010 New York's Veterans Day Parade in recognition of his 120 missions as a Marine fighter pilot during World War II and the Korean War, for which he received two Distinguished Flying Crosses. 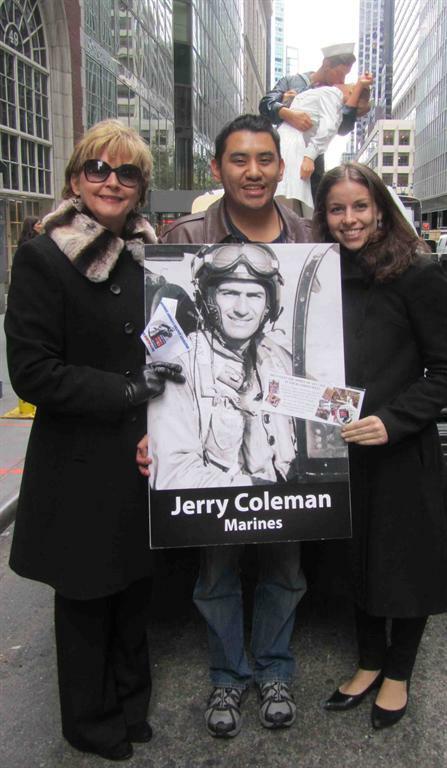 Jerry was the only major league baseball player to see combat in both wars, sacrificing 5 years of his career to serve his country, and received a warm welcome from New Yorkers who remember him as the MVP of the 1950 World Series Champion Yankees. 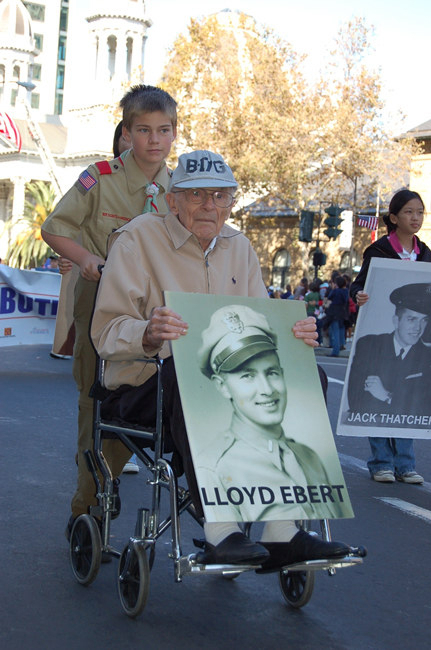 Jerry Coleman and WWII veterans on "Keep the Spirit of '45 Alive!" 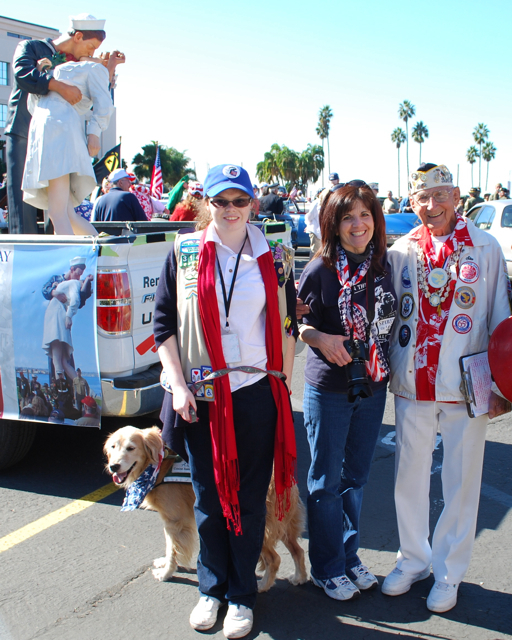 float in the 2010 Veterans Day Parade. 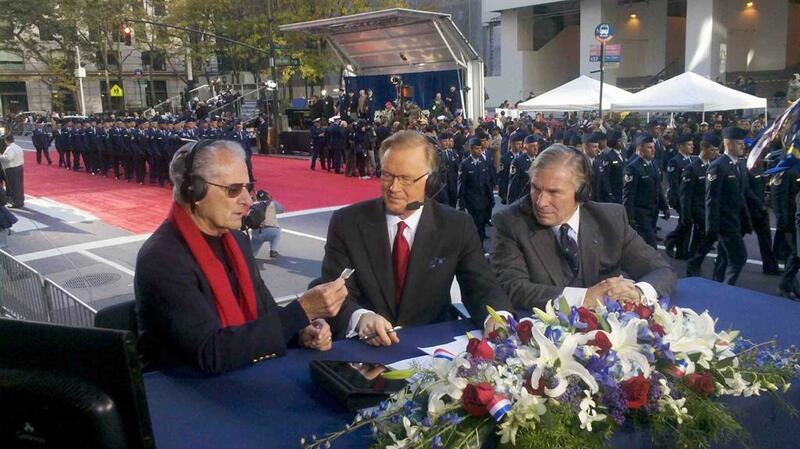 Jerry presenting Spirit of '45 Day pin to NBC's Chuck Scarborough. 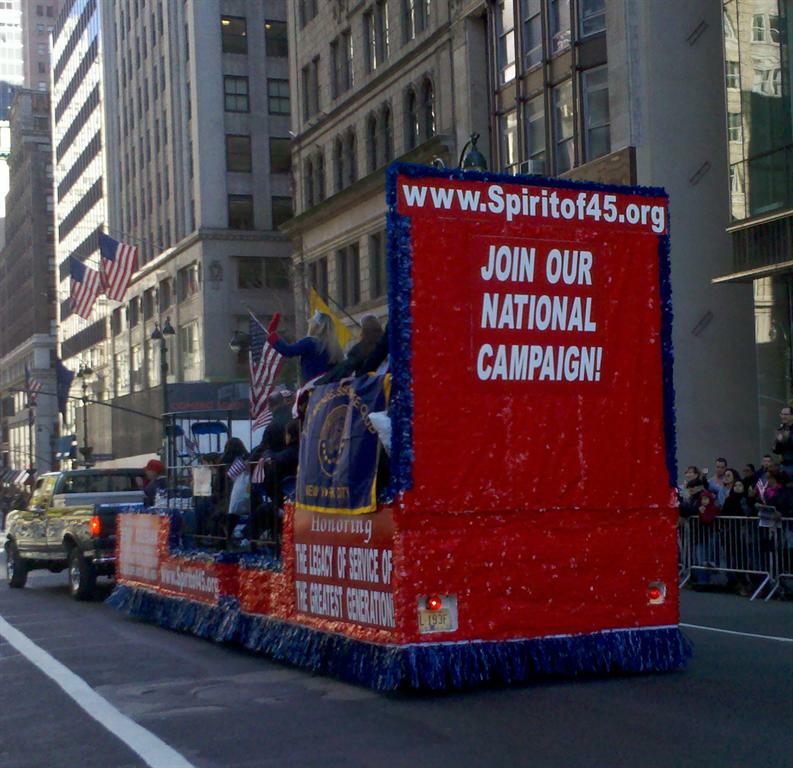 (Right) rear view of float moving up 5th Avenue. Nell Calloway, Robert Corpus and Kate Tafkovian with 6 ft version of the 25 ft Seward Johnson sculpture inspired by the "Times Square Kiss" of August 14, 1945 which is part of the "Keep the Spirit of '45 Alive!" 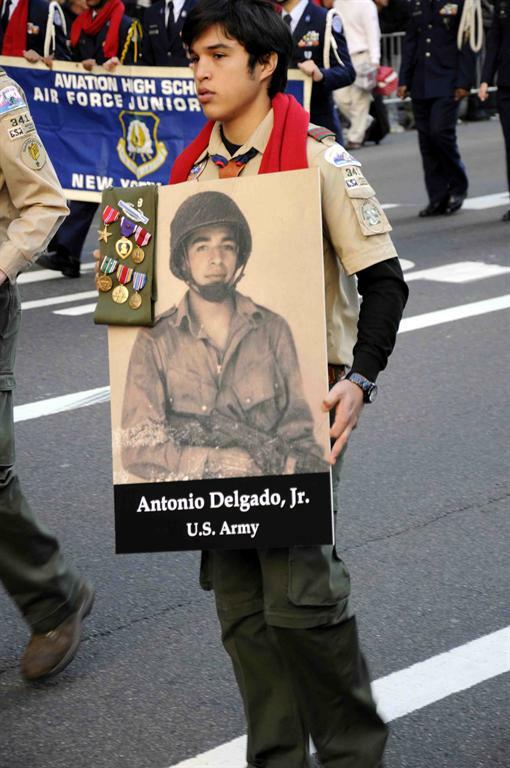 entry in the NYC Veterans Day Parade each year. 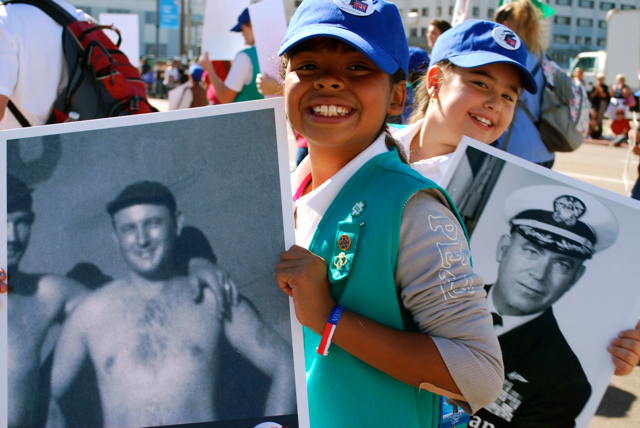 (Middle) Valerie Pfundstein with Girl Scouts who lead the youth marchers, and National Supervisor Warren Hegg. 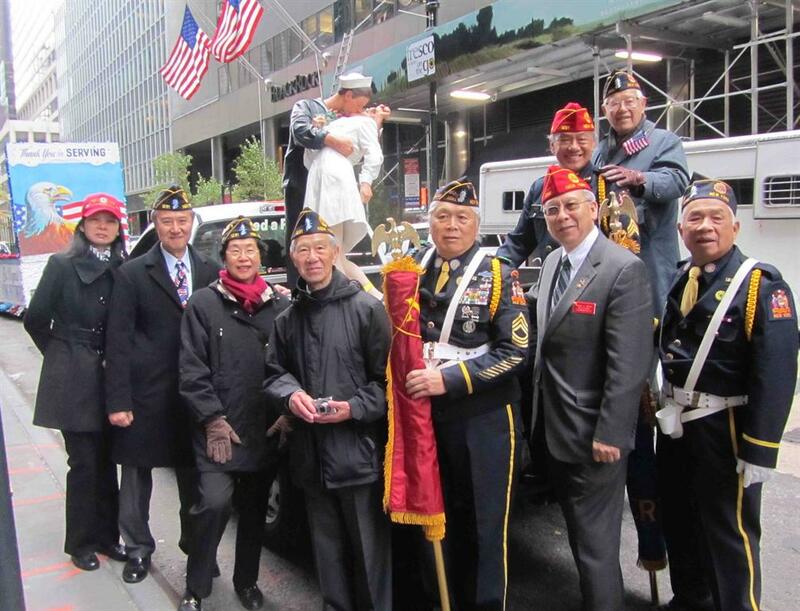 American Legion Past National Commander Fang Wong and Members of Lt. B.R. Kimlau Post in New York City's Chinatown, pose with "Kiss" statue.